Oceanhouse Media has published yet another omBook starring Little Critter called Just Shopping With Mom. For those unfamiliar, Little Critter is a series of stories written by Mercer Mayer about Little Critter’s childhood. 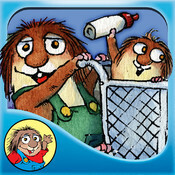 Little Critter is a hamster character who is full of imagination, love, and of course mischief! Little Critter is a great series as children can easily identify with his adventures and emotions and also helps teachers, parents, and kids themselves be aware of emotions and how to deal with those situations. In Just Shopping With Mom, Little Critter goes on a shopping trip to various stores with his mom, little sister, and baby sibling. Mom has the difficult task of getting shopping done and keeping her children out of trouble. So I’m sure parents of young ones can relate. Little Sister begs for candy and toys but mom tells her no. I used this book to teach my preschooler that to point out we need to behave, stay close to mom, and protect her little sister as well. Also, the point was clear in the book that everyone needs to be patient if we want something! A cute mini-game is found within the app where you find the mouse on each page. At the end of the book, the story calculates the total number of mice the reader found within the book. Oceanhouse Media does a great job at combining the original text and artwork of Mercer Mayer, yet providing extras, such as touching a picture to hear and see what that picture is of. You also can replay an entire paragraph if interested. The highlighted words feature is great for early readers. Little Critter goes shopping with his family which turns into an eventful day. While at the grocery store, his little sister becomes upset when she can’t buy candy, makes a big mess by pulling items off of the shelf and then gets lost in the store. The next stop is the mall to find a dress for his little sister. Finally, Little Critter’s patience pays off when mom finds a fun way to end the day!